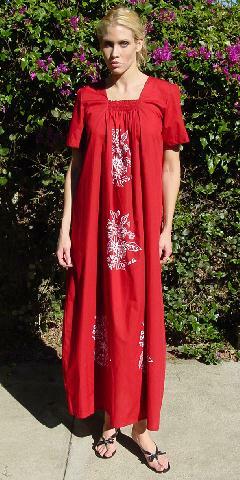 This vintage long dress was made and bought in Fiji. 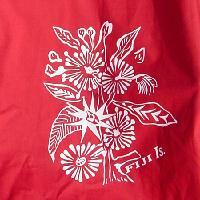 It's in a deep red brick-rust color with 4 areas of flowers and "Fiji Is." written in white. 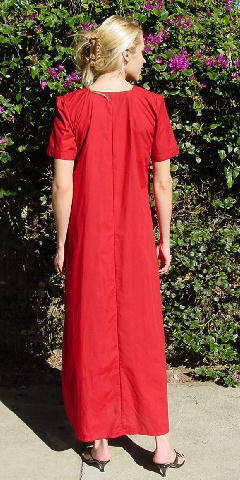 It has a modified square neckline with elastic at the base and short sleeves. A former model bought it while shooting on location in Fiji. It was never worn (except for these pictures). shoulder to hem 55 1/2"